If you're in the Kansas City area on Wednesday, March 21, 2012, you can hear emerging barihunk Chris Carr for free. He'll be performing a masterclass with world-renowned mezzo Joyce DiDonato and the Kansas City Symphony at 7 p.m.
DiDonato recently won a Grammy for best classical vocal solo for her album “Diva Divo.” She will give her first Kauffman Center performance at 8 p.m. March 23-24 and at 2 p.m. March 25 with the Kansas City Symphony. The masterclass features three Kansas City-area vocal students, including University of Missouri/Kansas City student Chris Carr, who studies with famed tenor Vinson Cole. Carr was a Lyric Opera of Kansas City Artist Apprentice in the 2011–12 season. 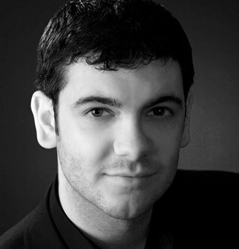 Carr will perform "Largo al factotum" from Rossini's Barber of Seville. The event is free, but register HERE to ensure seating. Not bad, he has a beautiful voice, but still lacks of ésprit and of proprety of words!